I named this series Fire & Ice as a bit of a nod to Game of Thrones and the A Song of Ice and Fire book series, so it’s exciting for me to have the show back. What isn’t inspiring is that I have to focus on Jose Ramirez this week in the Ice category. He is my personal favorite player in baseball, but I assure you that my analysis is separate from my player fandom. First, however, let’s begin in Pittsburgh where a promising young starter has opened the season with 15.1 shutout innings. While Pirates fans certainly don’t care to be reminded of the day their ball club sent Gerrit Cole away, that deal is finally bearing some fruit. Joe Musgrove came to Pittsburgh from Houston in that trade and started 19 games for them in 2018. He would have contributed all season if not for a shoulder strain, but he was still able to log 115.1 innings of 4.06 ERA baseball. On the surface, there wasn’t anything eye-popping in Musgrove’s profile. His walk rate was (and always has been) very strong, but the ERA and strikeout rate were mediocre. The 7.80 K/9 isn’t a head turner, but his 11.4% swinging strike rate indicated that maybe there’s more upside left to unlock. His slider and changeup were both excellent whiff-getters, with the slider generating 18.2% whiffs and the changeup at a crazy 26.9%. Those pitches are still performing very well thus far in 2019. The best news here is that the slider is working even better with increased usage. He’s tossing it 28% of the time, up from 20% a year ago. More sliders and fewer cutters are very good news for his strikeout rate, which has climbed to nearly a strikeout per inning this year at 8.80 K/9. He is also consistently getting chases out of the zone at 34.5%, which is even more good news for his strikeout rate. If there is any bad news here, it’s that his fastball velocity is down. He sat at 93.5 MPH last season, but to this point has averaged 91.2. Considering he was averaging 95 MPH on his four-seam last May, this is a discouraging development. In an attempt to cram some optimism into the bad news, at least his spin rate on the fastball has actually increased from 2350 to 2450. The four-seamer’s xwOBA is down slightly as well, from .359 to .350. His fastball command allows him to avoid the heart of the zone, further helping the pitch play up. Joe Musgrove’s 21.8% K-BB% is currently 24th among starting pitchers. He has the swing-and-miss stuff as well as the strong control to become a mainstay on the K-BB% leaderboard. There will be some bumps in the road, and his diminished velocity means less margin for error. Perhaps he continues to get bit by the long ball a bit too often (career 1.16 HR/9), but he improved in that regard last year. If he continues along this trajectory, you’re looking at a starter with top 30 SP upside. There was a fair bit of debate during draft season surrounding Jose Ramirez’s overall ADP of three. A lot of things went right for him in 2018 for him to finish with a 110/39/105/34/.270 line, it seemed. His impressive .392 wOBA was much higher than his .366 xwOBA. He struggled against breaking pitches. He had never stolen more than 22 bases in a season previously. Given the downside, his owners aren’t feeling too good about his .140/.180/.193 slash line 61 plate appearances into the season. To begin with, we have to consider that Ramirez’s Spring Training knee injury suffered from a fouled ball is still lingering. There’s no way for us to know for sure from the safety of our couches, but we have to keep it in the back of our minds. He has also fouled a ball off his foot already, but the trio of stolen bases offers some small reassurance that his struggles aren’t injury related. 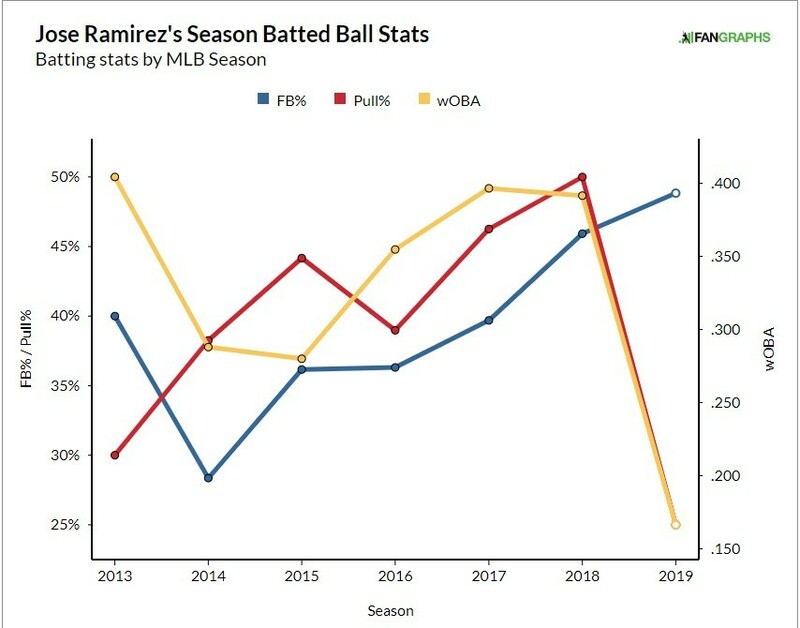 Frankly, Ramirez’s early plate discipline and batted ball profile look like they belong to someone else. For starters, the 2:10 BB:K ratio (3.3%/16.4%) are quite contrary to his elite 106:80 (15.2%/11.5%) BB:K from last season. His elite eye and contact rates are a large part of what makes him such a strong hitter. His career contact rate is 87.9%, but to this point, he is making contact at a much lower 81.5% clip. Contact rate stabilizes rather quickly, so that number is stark and concerning. His swinging strike rate sits at a career-high 7.8%, which is far from bad but not his uber-elite 4.7% 2018 mark. His 42.4% swing rate and 24.6% O-swing% are in line with his career rates though, indicating the walk rate will bounce back. Perhaps the most peculiar part of the early Jose Ramirez results lies in his batted ball profile. Last year we saw him take on a pull-heavy fly ball approach. He had a 50% pull rate with 45.9% fly balls, both easily career highs. It led, unsurprisingly, to a surge in HR/FB rate at 16.9%. That type of batted ball profile leads to poor BABIP’s though, which is why he was saddled with a .252 BABIP despite plenty of foot speed and hard contact. Early on, he seems to be trying to look like someone else. While he’s still putting the ball in the air, he is pulling the ball half as much as he was in 2018, at 25%. 21 of his at-bats – nearly a third – have ended with a fly ball to center or the opposite field. On those balls, just 28.6% of them have been hard-hit. He has a .095 BABIP and a .100 batting average on those outcomes. While that is slightly unlucky, those just are not good outcomes for a hitter. The MLB average on fly balls to the center or opposite field is just .183 with a BABIP of .112. A soft- or medium-hit fly ball that isn’t pulled is only marginally better than a pop-up. Perhaps he merely needs a mechanical tweak, but it could also be a conscious approach on his part to beat the shift. 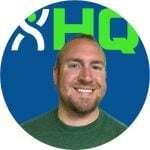 In 2018 he was shifted on 53% of his at-bats as a left-handed hitter and 6.3% from the right side. This year he has been shifted nearly every at-bat as a lefty at 97.6%, and 40% as a righty. Making a purposeful effort to go to the opposite field to beat the shift makes sense in theory, but the application has been disastrous. 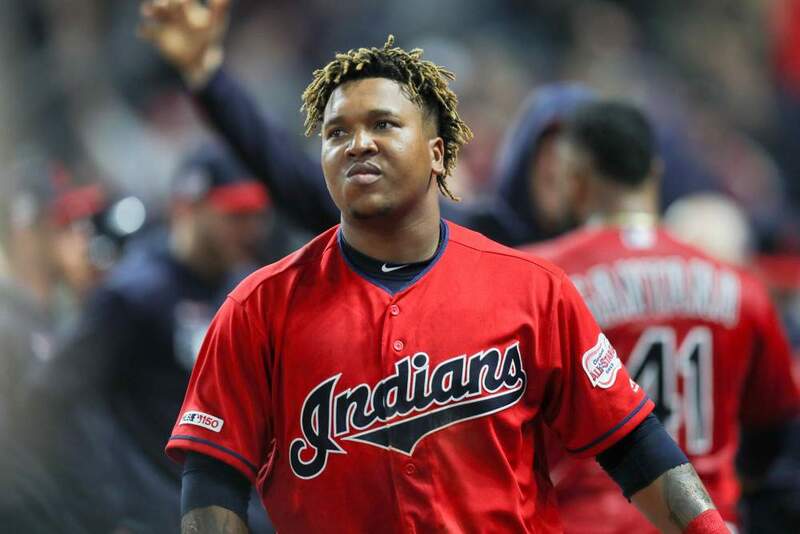 Jose Ramirez needs to get back to being Jose Ramirez. The unfortunate thing is, if and when he gets back to pulling the ball like crazy, the extreme shifts he sees will continue to tank his BABIP and batting average. If that means he actually hits home runs, though, I’ll take that trade-off. It’s also possible he’s pressing a bit at the plate, trying to overcompensate for a really bad Indians lineup that is missing Francisco Lindor. His R+RBI totals aren’t likely to come close to his 2018 totals considering how bad that lineup has been, and if he’s not getting on base as much, his stolen base totals are going to come down as well. He’s been an elite hitter for years though, so expect a bounce back in plate discipline and OBP. Weather the storm, and perhaps float out a trade offer if the Ramirez owner in your league is frightened. If you had Ramirez would you trade him for a package led by Benintendi? Looking at Spring stats for just K% and BB% they are similar to the early season and those tend to stabilize much more quickly than other stats. I wouldn’t. Beni just doesn’t have anywhere near the HR/SB upside JoRam has. I’m being offered Ramirez for Paxton. Jump all over it? Yeah I’m 100% taking Ramirez there.